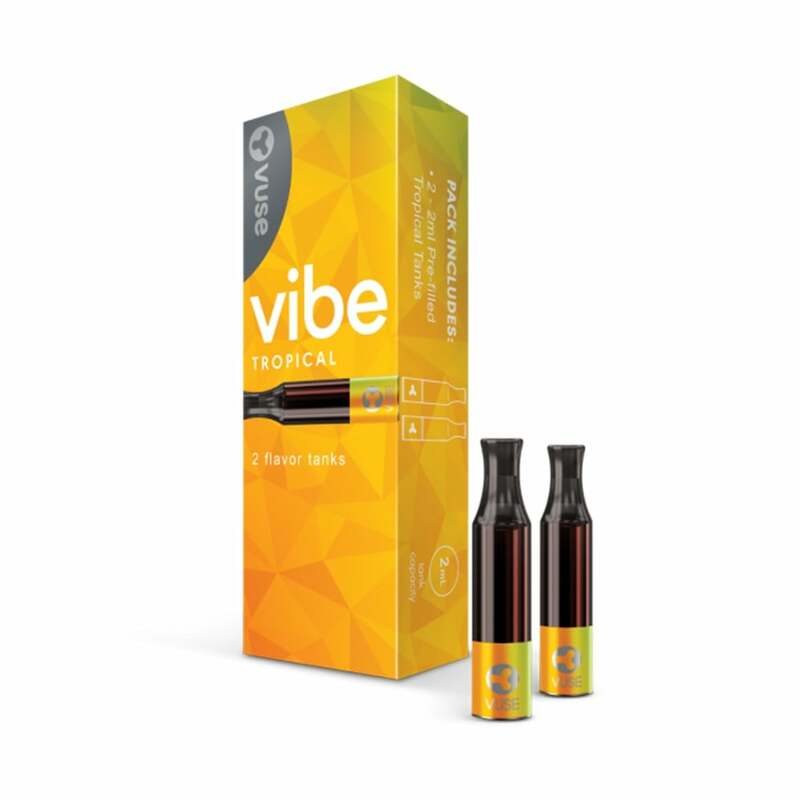 Designed to be used with the VUSE Vibe Kit, these VUSE pre-filled tanks in Tropical flavor will take you to paradise from the comfort of your own home! Packed with juicy tropical fruit tones, VUSE Vibe Tropical Tanks are the perfect option for anyone who wants to feel summery all year round. The Vibe by VUSE is a convenient and innovatively designed e-cigarette kit. It features a handy screw-on system which makes it easy to switch between pre-filled tanks, which come in a range of flavors including this tempting tropical option. A bit sweet for me. I like nectar better. Starts off fruity which is good, ends up a little too flowery for my tastes. Other than the slight after-taste, it is smooth. If you like a bit of flowery after-taste, this is the one for you. Surprisingly sweet and savory! Call me weird but drinking flavored water or even tea while smoking Tropical flavor is tasty. Well balanced and other brands should carry something like this flavor! Well done! I have ordered this product , the Vibe refill tanks,several times. When it wasn't in stock, THEY NOTIFIED ME, when it was back in stock. That was fantastic. Awesome flavor love the vuse vibe! Great service also! Best taste of all the vibe tanks. Hopefully the vibe tanks return, & in stock very soon. Best flavor for vibe. Me and the wife love them. Always fast delivery and exactly what we want every order. Had never tried this particular flavor before and LOVED them! I really like this flavor. It is fresh and fruity without being overpowering. Much better than the nectar. One of my new favorites. Melon and tropical are my personal favorites. Menthol n mint are good just don’t like the minty taste afterwards. Tobacco is ok if in a bind. Nectar taste like dirt. But melon has never failed me, now I can rely on tropical too. I wish these weren’t being discontinued. The vise ciro is garbage!!!!! One cartridge last less than 6 hours if used regularly and cannot hold a charge. Vuse solo is weak in my opinion. Vuse vibe get em while you can. I love vuse vibe, but this flavor I just can't abide. I WISH they would add the chai or crema to this line. very fruity flavor . One of my favorites. That's saying a lot being I'm very picky. I really love the flavor.